New Amp!! Fender Blues Jr. I finally got a new amplifier. It's been a long while since I bought one, since I have been so happy with my Atomic amplifiers and the computer-based Line 6 TonePort. 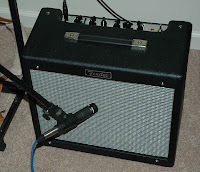 I really like this little amp... it has that beautiful Fender clean tone and it can create a really nice early break-up blues tone, as well. I have my Wylde Crybaby Wah Wah in the chain along with an old Boss DD-3 I have had since I was a kid. Never had much use for it until now. 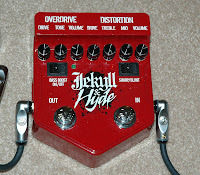 I have the DD-3 set for "shred style" tone thickening when wailing on full distortion with the Visual Sound Hyde pedal. ;) Sounds great. 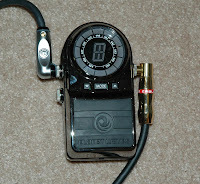 I also bought the Planet Waves tuner pedal, which is built like a friggin' tank. 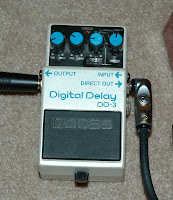 It works very well and it has true bypass, which is a must for a tuner pedal. You don't want something like that sucking your tone. I recorded a rough take with a blues backing track using an SM-57 and the TonePort straight into the computer. I setup the backing track loop in Cubase SE, put on some headphones and let it rip. Here is the raw recording with just a touch of EQ and some thickening by track doubling and a hard stereo pan: Blues Jr. Test Recording (mp3 format, 3.1 mb). I used my Custom Shop '60s Relic Strat with the overdrive pedal engaged and the neck pickup selected on the guitar. No other effects, pre or post, were used. I'm baaaaack... and with a major haircut! Still cycling and loving it, but the guitar has seduced me back into all things music. Whoa! I finally did it... I bought a Gibson! I said I would never be a Gibson owner, and I certainly never thought I'd ever own a Les Paul. I always had trouble playing them because I grew up playing the flat profile Strat shape. After spending a good amount of time with my Grestch Power Jet I finally trained myself to handle the higher bridge. I LOVE this guitar. It is a Les Paul Classic, so it isn't the most expensive model but not the cheapest either. This particular one felt really good, has tons of balls and plays exceptionally well. After spending a few days probing thoroughly I just can't find anything wrong with it. ;) It's definitely a keeper. The Classics have the thinner 60's profile neck, tall frets and slightly yellowed trap inlays. The fretwork on this guitar is very good and well finished... nut is superbly cut and the Nashville TOM bridge appears to be of the pre-slotted variety, so there are no slotting issues on the bridge. The thumbscrew pins are bent slightly because the stopbar was screwed down way too tight and I think the string pressure bent them. I have new ones on order from Stew Mac. I'll be re-stringing with a "reverse wrap" on the stopbar from now on. This will allow me to screw the stopbar all the way flush to the body without having too sharp of a string angle (thus, avoiding more bent pins and a collapsed bridge!). This should also provide better coupling and a slightly rounder, warmer tone. Since this particular guitar seems a bit on the treble side I think a reverse wrap will balance things out nicely. This guitar has tons of sustain! The stock pickups are really hot and could probably stand to be lowered a tad from the very high factory setting. I'll probably experiment with some Duncans just to see if I like them. I will also be ordering a new blank pickguard and truss rod cover so I can get rid of the unnecessary script on those items. Overall I am very happy with this guitar! I have always wanted a Goldtop Les Paul, and I am lucky to have found one with such good fit and finish. Gibson quality can be hit or miss so I feel extra fortunate that this one turned out so well. More to come as I do some PU mods and set her up!